The month of July brought with it a host of festivals. Some were small ones, celebrated without much ado, while some involved a lot of preparation. Some were small ceremonies celebrated quietly at home, while some were big affairs, with hordes of people coming home. July has passed us by, and so has August, but the next couple of months bring even more festivals our way! It has been tiring in some ways, and from the state of my blog, you can realize that I haven’t been able to pay much attention to it. However, it has also brought with it, lots of opportunities to bring forth my creativity. Hence, I thought of this post as an update about what I have been up to! We started the month with a small festival celebrated at home. This is our annual offering to our family deity. 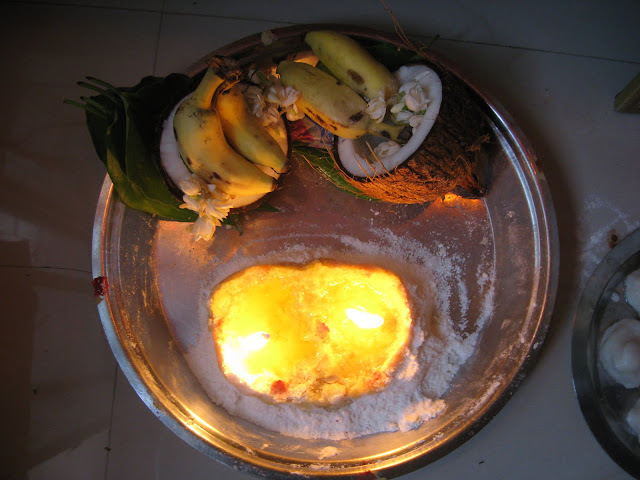 We call this the ‘Maa vilakku’, literally, a lamp made of flour, and offer it to the deity on one of the Fridays of the month of Aadi (the Tamil month which falls around July-August). This involves grinding fresh rice flour, adding some jaggery, and making a lamp like shape with the mixture in which ghee is poured, and a wick is lit in it. as the wick uses up the ghee, the heat sort of cooks the flour and jaggery mixture. 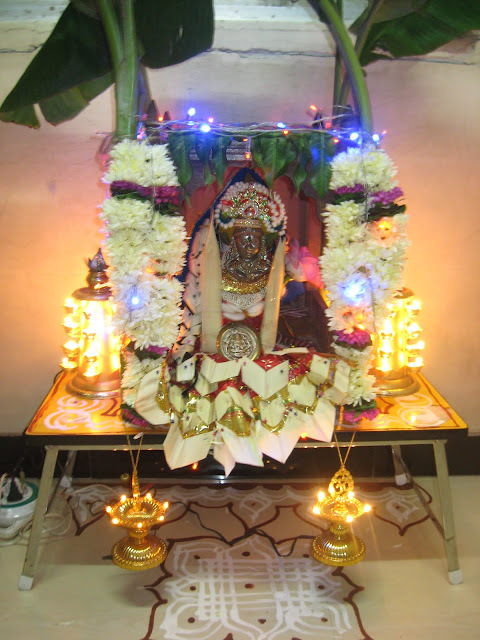 This lamp is considered a representation of the deity, and it is to it that we pray and make our offerings. Once the prayers are over and the flame is out, the mixture is rolled into small balls, and eaten as the blessing of the deity. 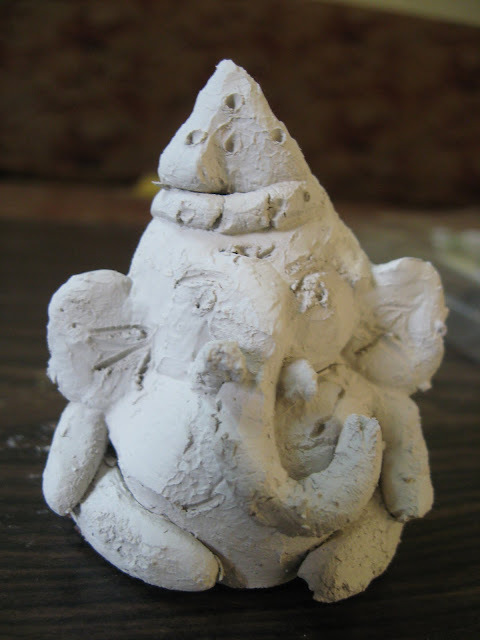 The arrival of August heralded the biggest festival of the month – Varalakshmi Puja. The annual prayer to goddess Lakshmi to bless us with prosperity for the year is a family festival much looked forward to. For Samhith, it is time for his favourite foodstuffs as prasadam, for my mother in law, it is a chance to go the full length in carrying out the puja exactly as she has done for the last 45 years, while for me, it is an opportunity to decorate the goddess in the best way I can! 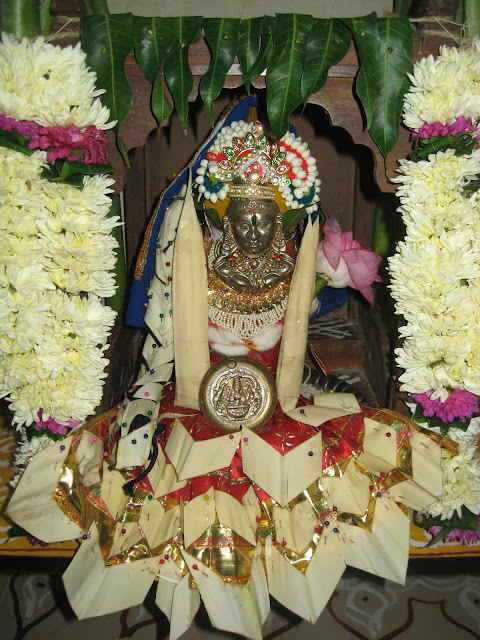 This year, I was especially lucky to get some wonderful kevda flowers in abundance, and I indulged myself, decorating the deity almost entirely with the fragrant off-white flowers. I especially enjoyed adorning the deity’s ‘hair’ with it, just the way my mom used to decorate my hair with it when it was still long and thick! Finding still more flowers left over, I even stitched it to the dress! This festival especially gives us so many outlets for showing our creativity. 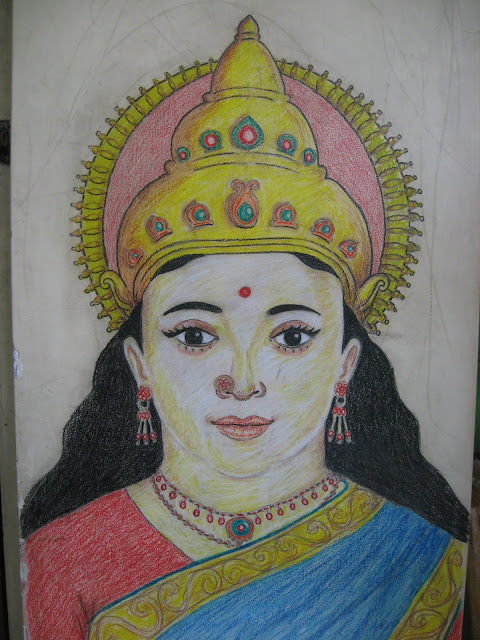 Look at this sketch of the goddess drawn near the entrance of our house. 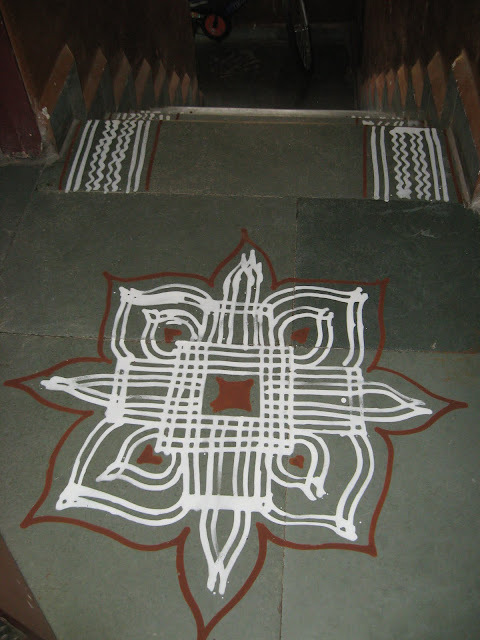 This is where we welcome the deity, and every year, Shankar’s uncle come over to either draw a fresh sketch, or touches up the existing one, so that it looks as good as new! She stays there all year long, a constant reminder to her presence in our house! It was then time for the only ceremony which the men of the house had to participate in – Avani avittam, a day when they change their sacred thread and recharge it for the year! No photos, sorry! Since I had nothing to do, and was dragged out of bed, was too sleepy to take any pics! After all the ceremonies for us women and the men, it was Samhith’s turn – Rakshabandhan! He may be an only child, but there are many who call him ‘anna’ or older brother, and this year, three of them tied him rakhis, making him ecstatic! The fourth to tie him one was my sister! 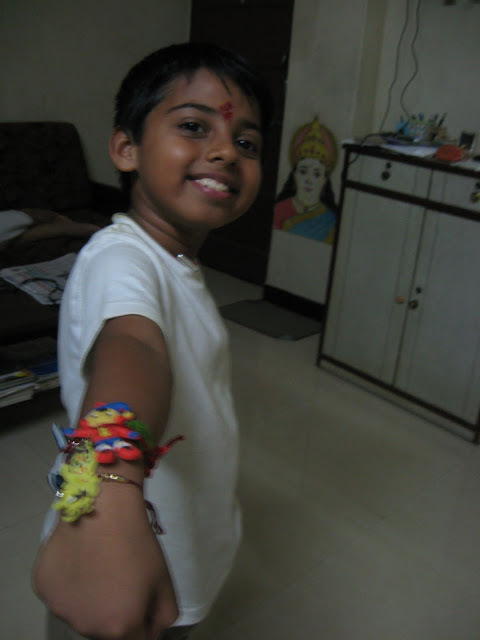 Here he is, showing off all his rakhis, and after that is a small video showing how thrilled and embarrassed he was, when one of this ‘sisters’ tied him Rakhi in the traditional way! And yesterday, we celebrated the birth of Lord Krishna in a simple way, with a small idol of the Lord dressed up in his finery, and with the kind of offerings which Samhith loved eating – milk, white butter and parched rice! 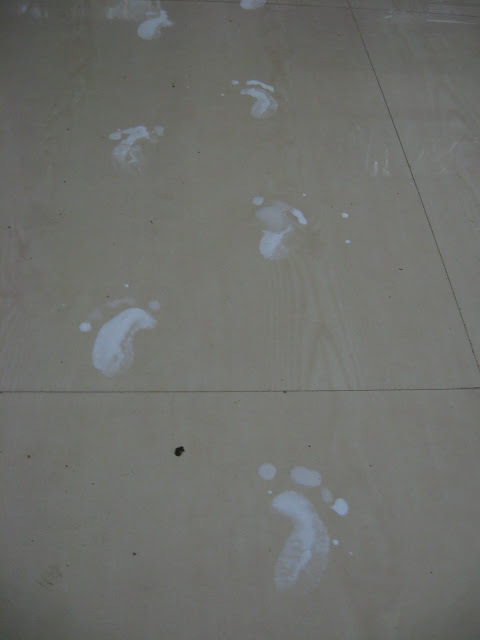 I especially love marking footsteps which symbolize Krishna entering our house! 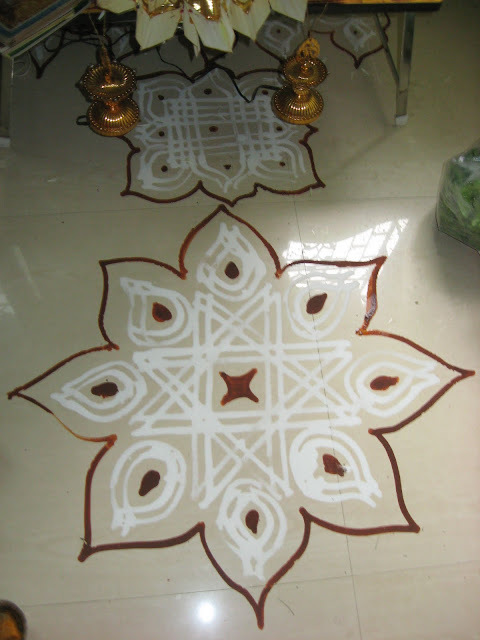 Speaking of creativity in relation to festivals, how can I neglect to mention the kolams which decorate our house, both inside and outside? These are, after all, my favourite works of art! I certainly like the ones Samhith made a lot more. Especially that last one, which he made without any help from me! 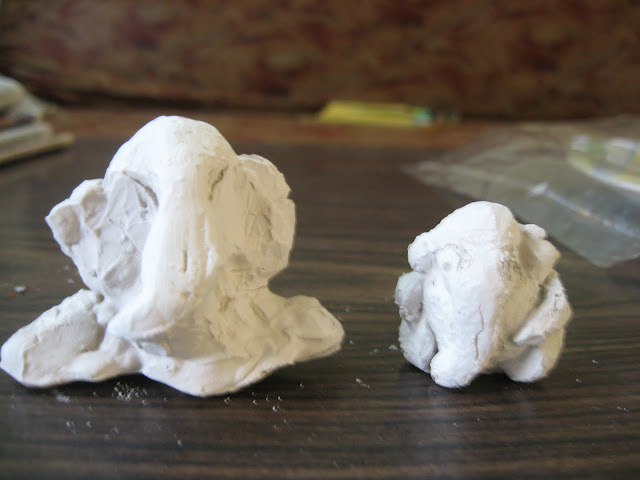 And these are some tiny ones we made with leftover clay. 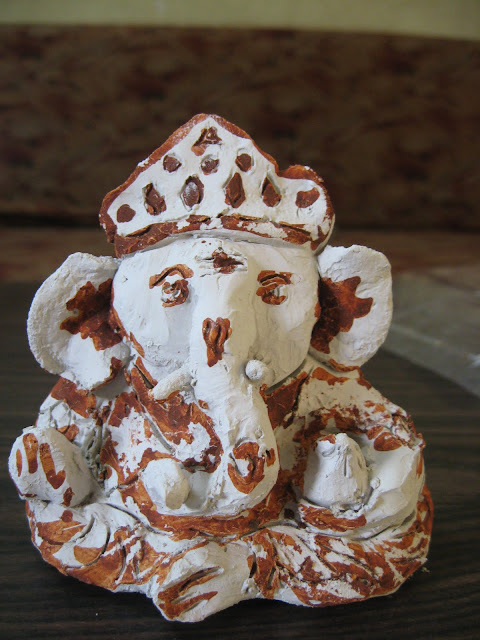 They look more like modern art than traditional Ganeshas, don’t they? 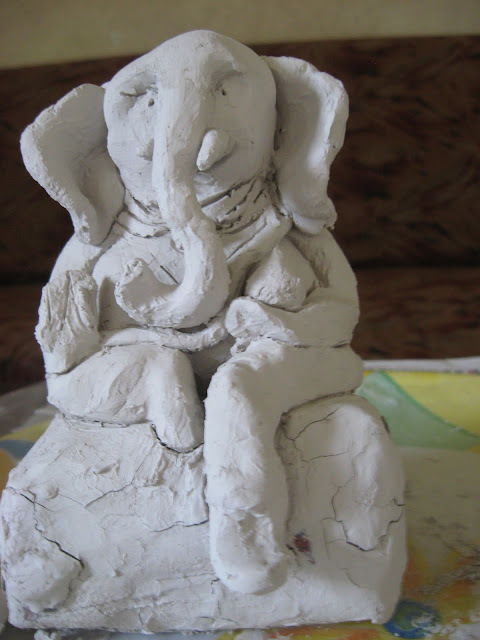 After Ganesh Chaturthi comes Navaratri, which is the next big outlet for our creativity. 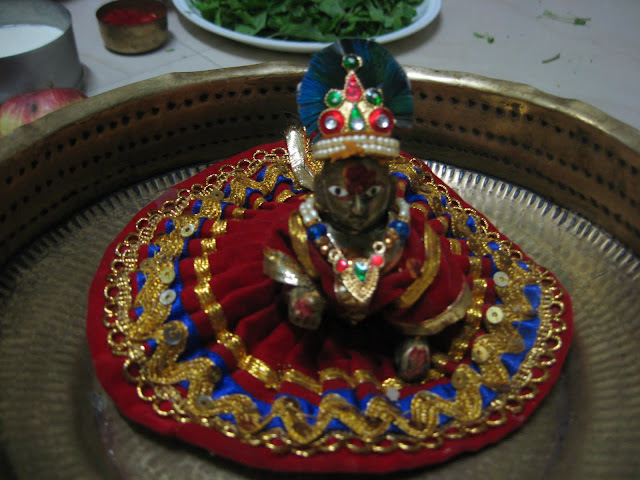 We have yet to think of a topic for our annual Navaratri Golu. Any ideas? Lovely post, Anu. Enjoyed the write up and the pics. Loved the video. 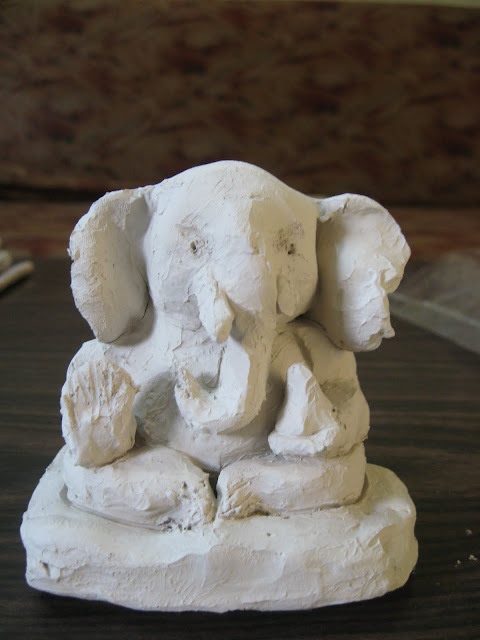 Ganeshas are beautiful. Samhith has done wonderful job. Lovely pictures. After Chhavi ties the rakhi to my nephews she wants one for herself as well! The sketch is very beautiful. 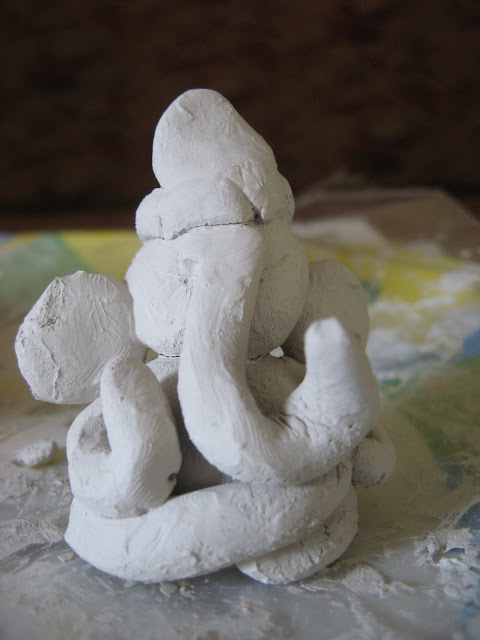 The Ganeshas made by Samhith are cute, especially the first one. Thanks Mridula! I remember my sister going through that phase too! We used to send rakhis to all our cousins and she would wonder why no one ties her one!! Thanks Pradeepa! I will be sure to tell him u said that! Thanks Charu! I used to love making seedai and murukku too... and my mom still makes them, but we have dispensed with it now.... easier to buy it.. but i miss the fun we had then! Thanks Chitra! oh yes, it does make him feel "great!""